When visiting the Broome Bird Observatory, it’s hard to miss the resident wildlife that gathers in and around the camp’s ablution blocks; from the highly venomous King Brown Snake (Pseudechis australis) to the harmless Stimson’s Python (Antaresia stimsonia), some of Australia’s notorious reptiles are drawn to this place to hunt Green Tree Frogs (Litoria caerulea). These ever smiling and relaxed amphibians love to live in toilet bowls – hence its nickname Dunny Frog – during the dry season, when water in the bush is scarce. Although it was easier to find them when flushing, the sight of the dust covered tree-climber was well worth the spotlighting effort. Talk about desperation, having to search for water in an Aussie toilet! Poor frogs… Although judging by the smiles on their faces they don’t seem to mind it as much. I’m sure having a snake or two in the ablutions helps to move things along quicker and keep the queues short! Haha, they really like their second home, Dries – they even don’t mind being flushed as they’re real floaters. A King Brown would stop me from going to the toilet altogether, but when a Stimson’s Python hangs around I’ll be there just for the photo opportunity – they’re tiny but beautiful creatures. Love this adaptation – what a useful ‘Eco-niche’. Just imagining the etiquette involved in sharing the ‘space’. 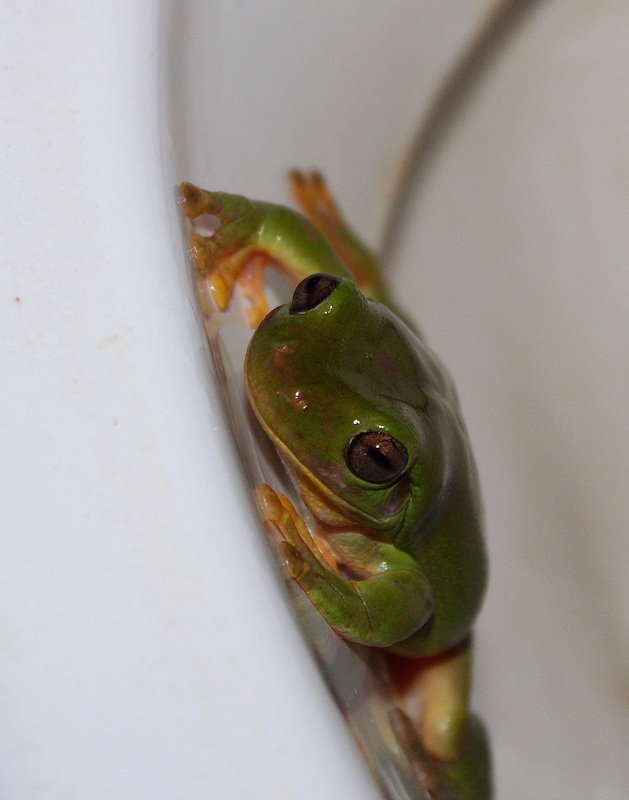 Hi Maurice, so you found a Green Tree Frog in the toilet bowl also, my wife did too while at the BBO . I read her what you wrote about the snakes, and she was glad she had not seen any there. Great pictures! I love frogs! what a lovely angle, and such a cute frog. very nice work !